If you like fresh milk how would you like it delivered to your door two to three hours after milking? Would you like to specify the cow from which your milk came? Would you like to try a few cows before you find one you liked more than the others? Did you even know it was possible to detect a difference in milk from different cows? I suppose there must still be milk conoisseurs out there. Farmers, certain chefs or restauranteurs perhaps but we hardly ever get milk straight from the source these days. The age of refrigeration has brought a standard kind of milk which tastes pretty much the same and is completely safe to drink. And it’s icy cold which is the only way I would want to drink it. But it wasn’t always like that and there was a time when people who drank just as much milk as we do had different arrangements for getting it fresh. 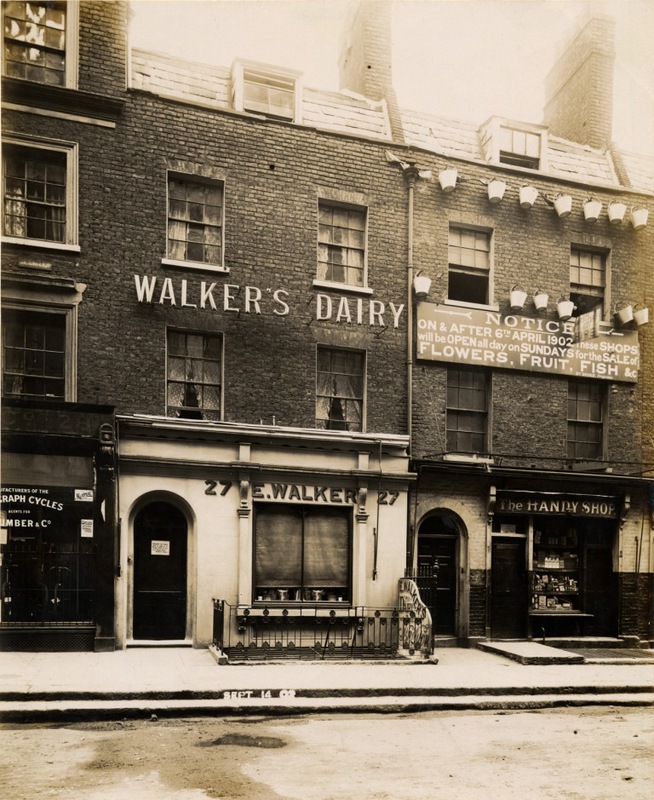 In places like London that meant the urban dairy. 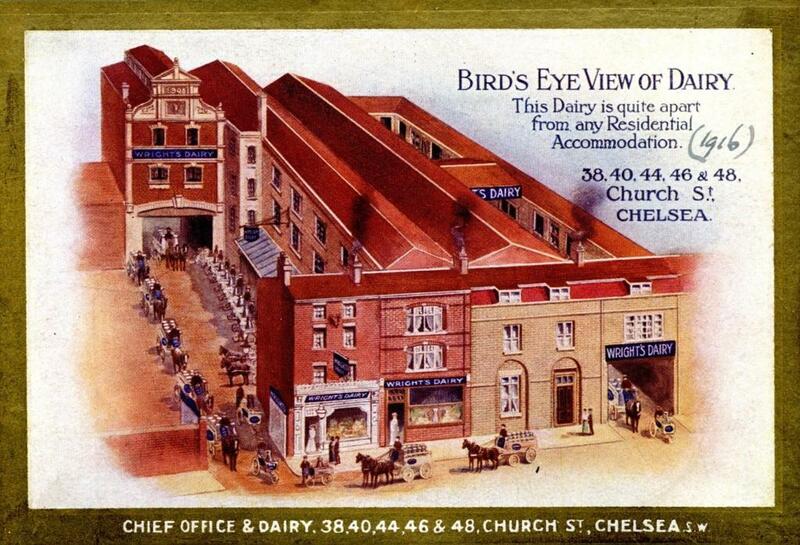 This is an artist’s impression of an early dairy when Chelsea was far from urban, although probably not quite as rural as the picture makes out. 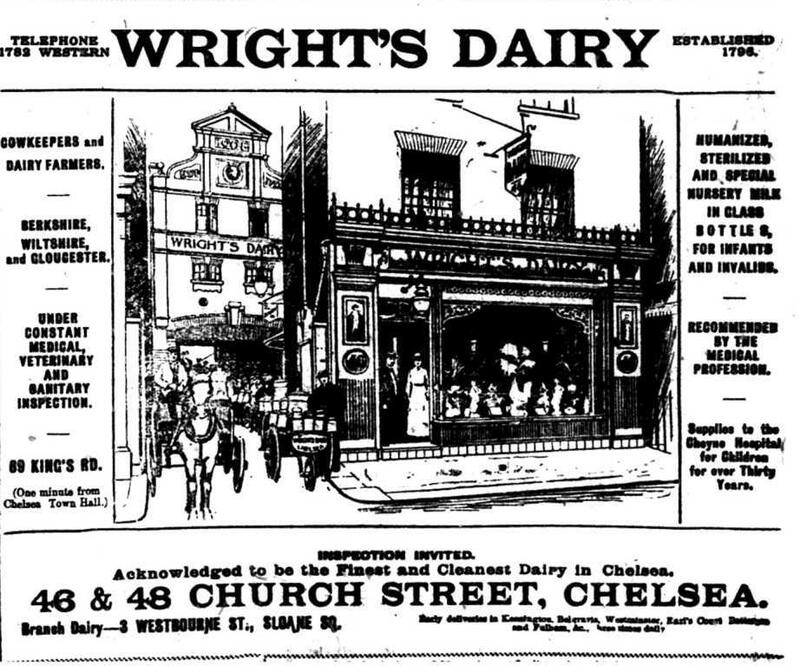 Wright’s Dairy in Cook’s Ground (later Glebe Place) was one of the first in Chelsea. They were just round the corner from Thomas Carlyle’s house in Cheyne Row. The original Mr Wright recalled in later years that they kept two goats on the premesis to meet the great man’s dairy product needs. Milk has always been considered a healthy product. 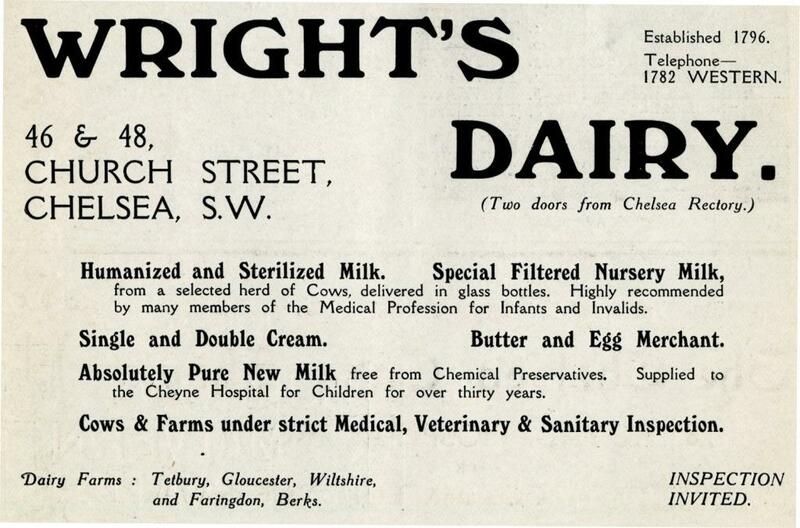 By 1914, the year of this advertisement in the West London Press Wright’s were reminding the discerning consumer that they were the cleanest dairy in Chelsea, inspected by medical, vetinary and sanitary professionals. “Humanised milk.” Don’t worry, not a genetic modification to the cows, just a technique for changing the amount of fat in the milk so as to make it more like human milk, usually for consumption by babies. 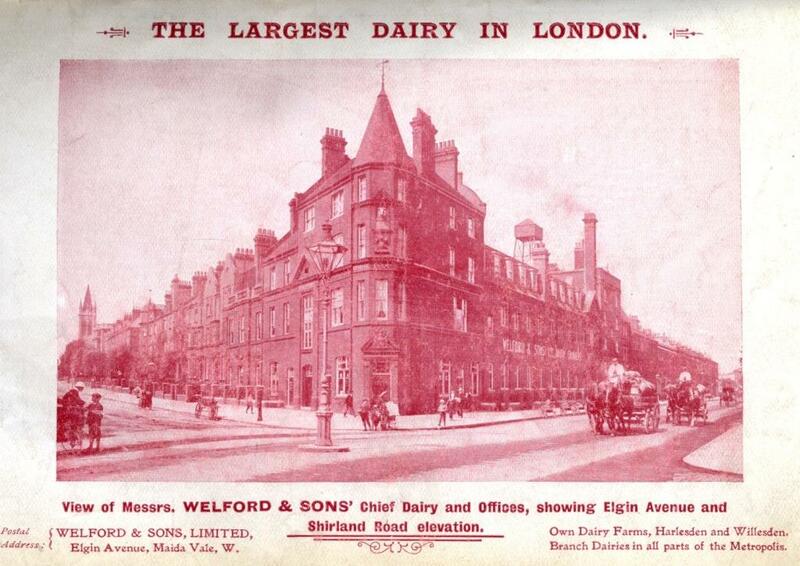 Urban dairies used to maintain farms near London but also kept cows on the premises for instant production. Wright’s were one of the best known in Chelsea but there were competitors in the neighbourhood. Green’s, a distinctly upmarket establishment. Fish and Sons, possibly less so. Not forgetting of course, a family firm to which I am probably unrelated. 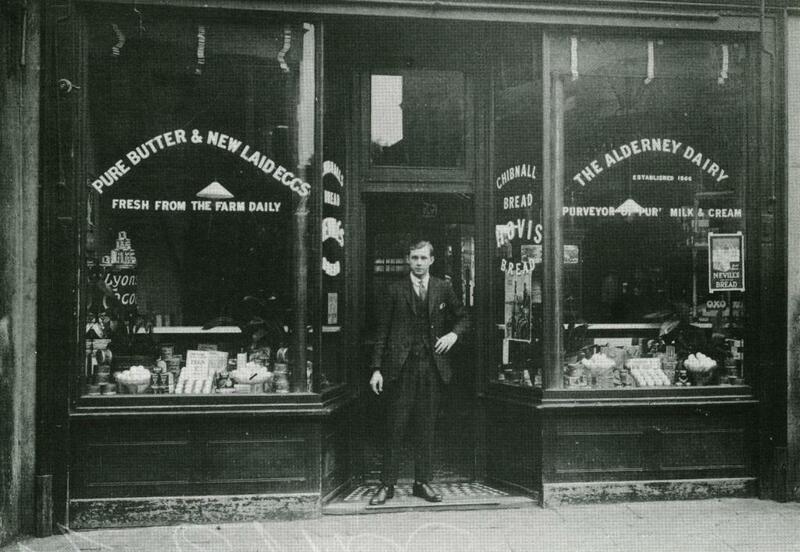 An establishment which was speedy with the milking and able to adapt to the customer’s needs. They didn’t spare the hard sell either, with an endorsement from the BMJ, and a decisive slogan. 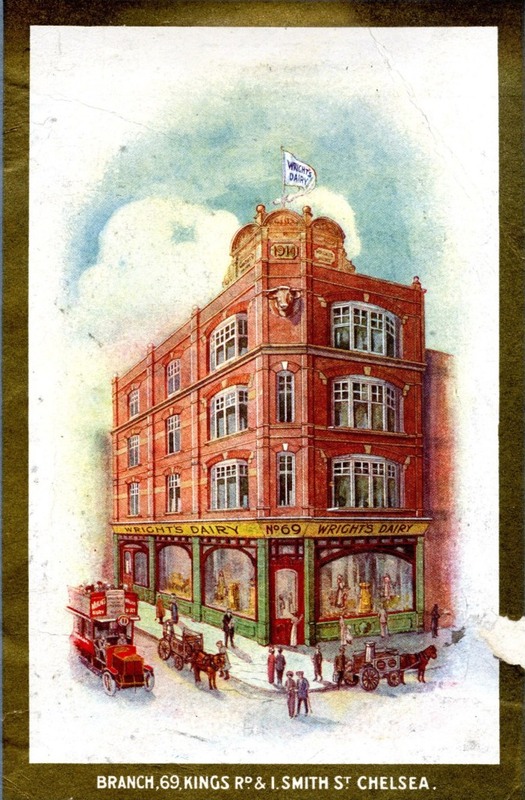 This was their Hans Crescent (New Street) shop, close to the businesses and residences of Knightsbridge. Every neighbourhood had one or two dairies. 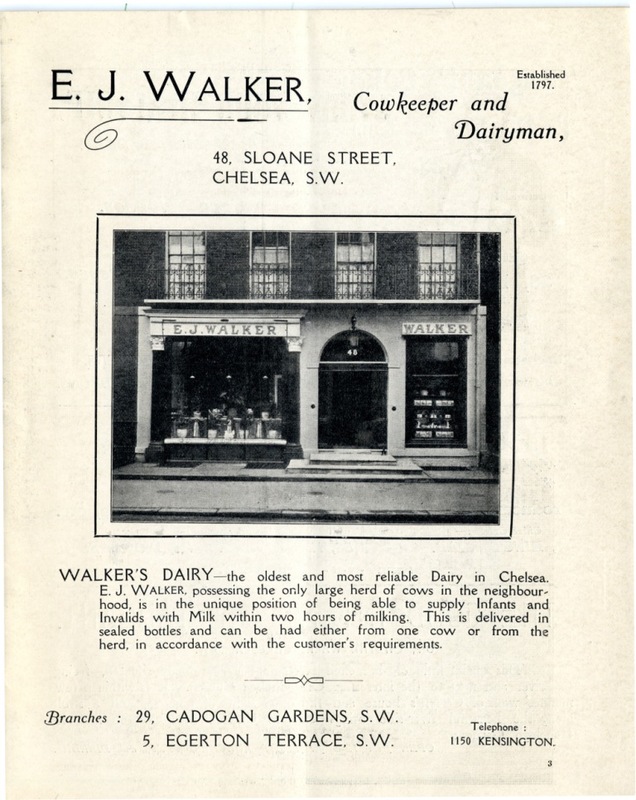 Small, such as the Alderney Dairy in Portobello Road. 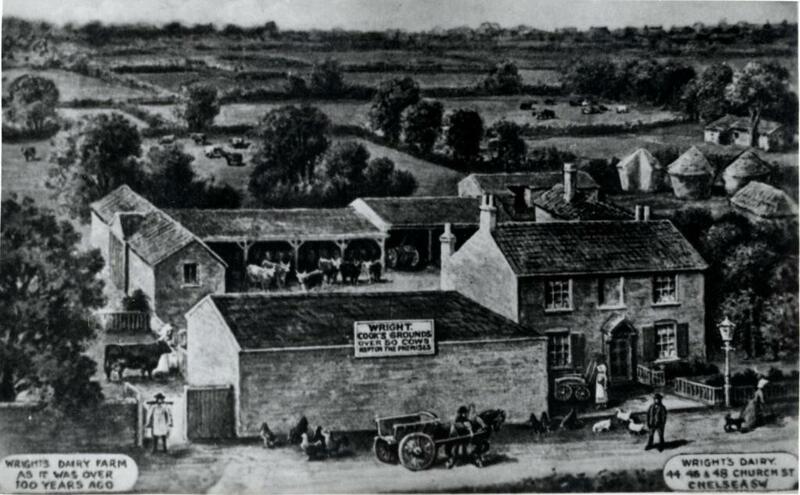 Welford and Sons main dairy. Look closely if you can above the entrance and see if you can make out a cow’s head. You can see a large example at Wright’s King’s Road outlet. Being placed at the top of a building these heads have often outlived the dairies themselves, as we shall see in a moment. But first a bit of history. 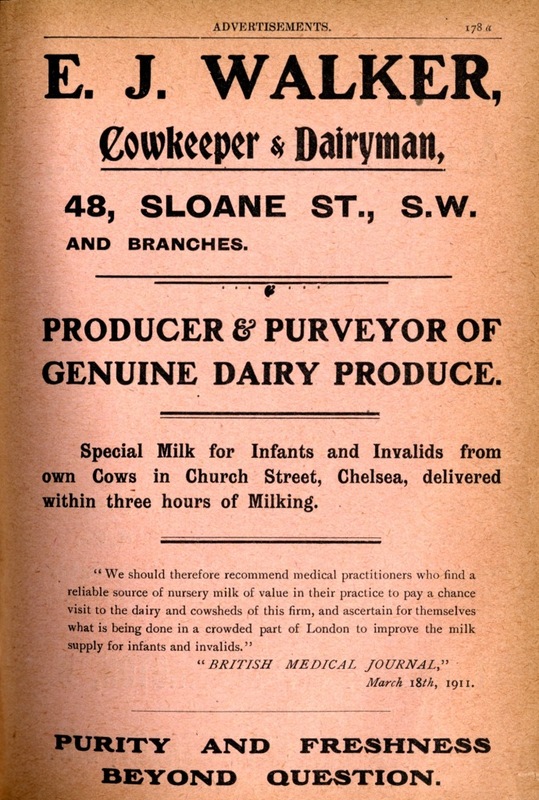 As transport and refrigeration improved, the cows returned to their farms, but the dairy businesses continued as milk delivery to the consumer’s door became the norm. The smaller firms were subsumed into larger businesses. 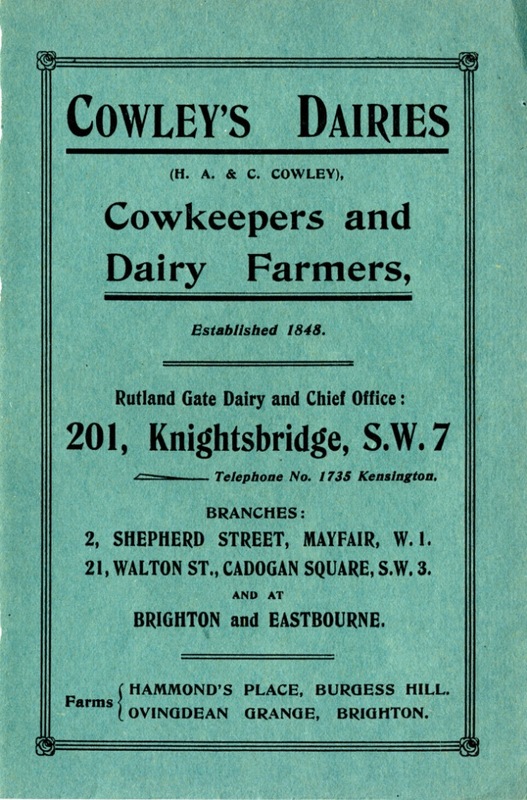 Wright’s became part of United Dairies which itself merged with Cow & Gate to form Unigate in 1959. By that time much fewer premises were required. The dairy buildings were demolished or re-purposed. And sometimes the cow’s head survived. 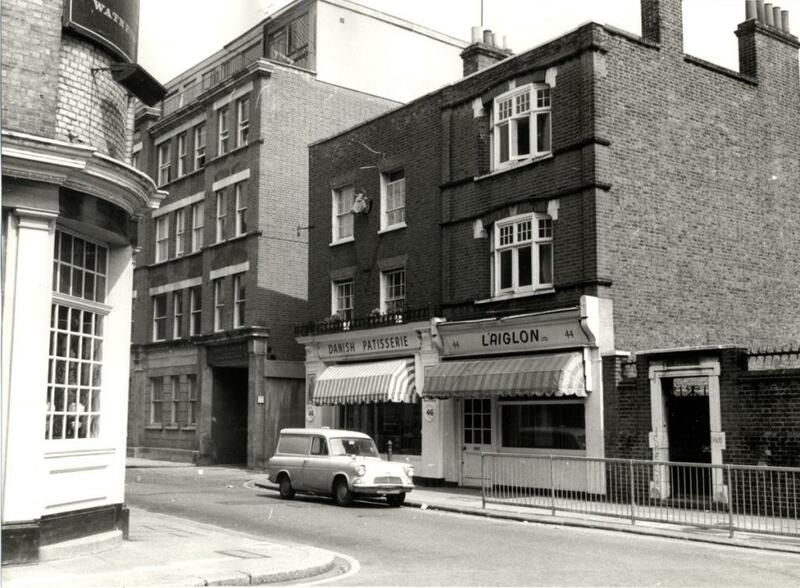 Part of the Wright’s building in 1971 in Old Church Street. One depicts cows in a rural setting, the other a dairy farmer. These are still there, and you can see them on Google Maps. And here’s one from 1969 showing upper facade of the 69 King’s Road branch of Wright’s seen above. But next time you’re travelling along the King’s Road on the upper deck of a bus have a look for yourself. And if you spot any of them anywhere else, take a picture and send it to me. One of these days I might do a cavalcade of cows. 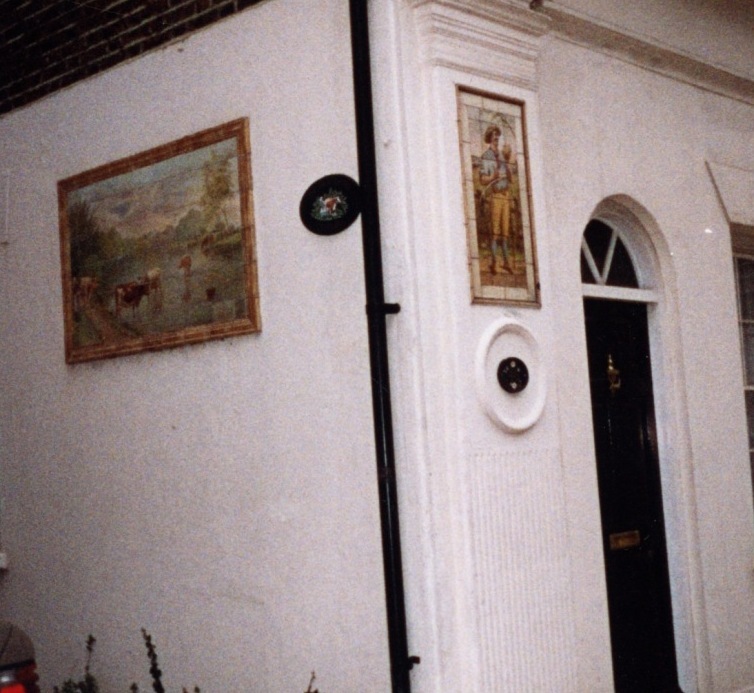 This entry was posted on Thursday, October 8th, 2015 at 12:29 am	and posted in 19th Century, 20th Century, Chelsea, Kensington. You can follow any responses to this entry through the RSS 2.0 feed. 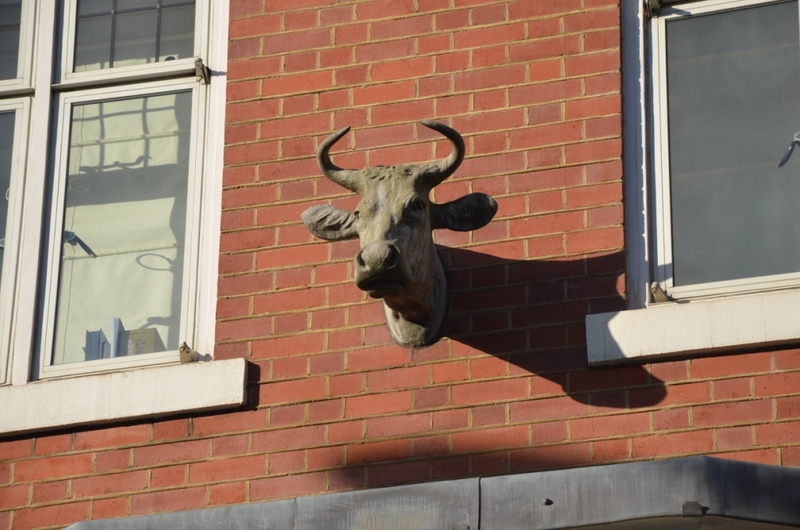 Excellent post David… the cows head in Old Church Street has delighted me for many years… With kindest regards. Oh wonderful! Thank you. 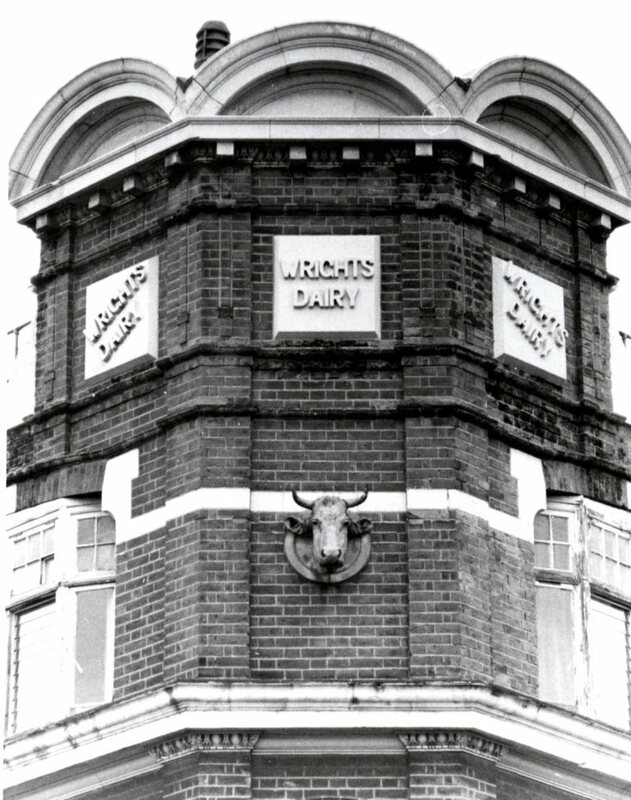 I see those cow’s heads on the Wright’s Dairy buildings on a daily basis, and adore them! Good to know more about their history. Thanks David…Brought back memories of the humming of the electric diary carts in the seventies, The aluminum bottletops which would pop up when the milk froze over in the winter. 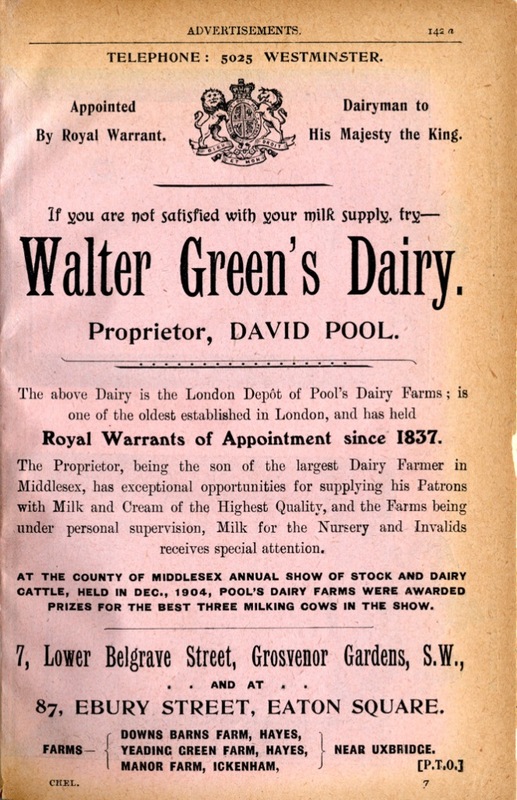 I notice that E J Walker’s timing for milking to customer slipped from two hours to three in the second advert. It is impressive that you could choose your own cow. I really enjoy your posts so much it is an area I both lived and worked in and it is a great source of fascinating information. My aunt lived in flats by the fire station for almost all her life and also started a patisserie called “Bonne Bouche” in New Kings road. I believe she opened a second branch somewhere in the area as well. 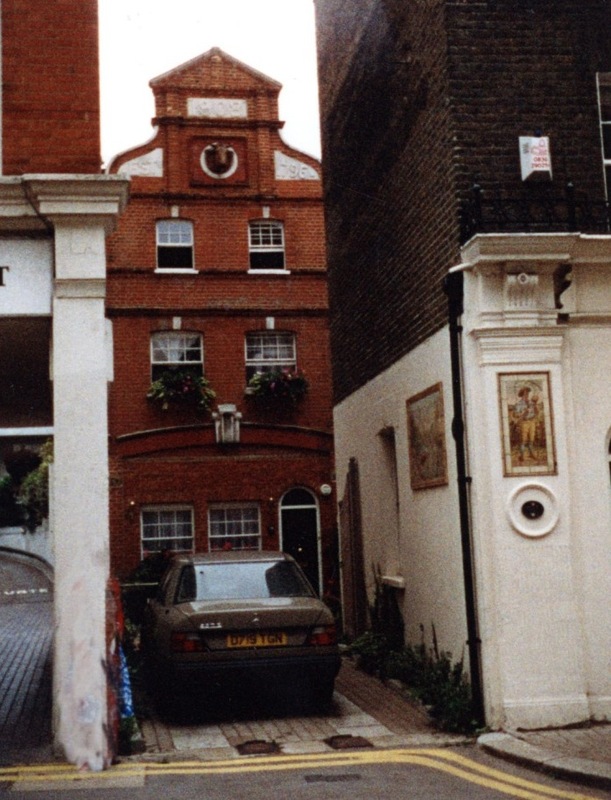 There was a Bon Bouche in Bute Street, South Kensington for many years: although much changed, it might still be there. It was our favourite patisserie for 20 years 1971-91 and I would love to know more about the owner, as many products were unique. Add these glimpses of forgotten social history to your ‘to do’ list when you’re next in London, courtesy of Dave Walker’s superb Kensington library website. Give him an award someone!